* This dress will be available at the next Fringe & Lace Facebook flash sale, tune in Monday 12/16 at 7pm (Central Time). Sign up here to have the sale show up in your newsfeed. This darling dress is the perfect candidate for today's MidWeek MixUp. You too can scoop up this birdcage frock at the next Fringe & Lace Facebook Flash Sale, Monday 12/16 at 7pm (Central). Register here & never miss an event (they will show up in your newsfeed like regular posts). Great outfit! I really love the tights! I absolutely LOVE the polka dot tights, so perfect! Jessica, I'm totally convinced you have the most perfect dress collection EVER. I'm in love with every one you wear! Love your dress and jacket! It is beautiful! The polka dot tights are adorable and I love this dress on you! That dress is too cute! Love the colors. And it looks fab with the leather jacket! 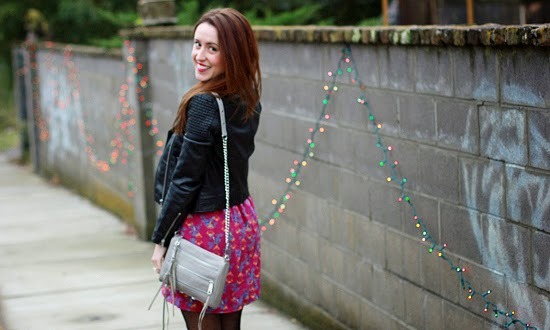 I love leather jackets because they can make a girly dress like yours look so tough and edgy! Great look! These. pictures. are. perfection! I love that there are lights hanging in the background! So perfectly seasonal and fun, AND they compliment your dress so nicely! I love the pairing of the tights + dress. I'd be worried to wear polka tights with a printed dress, but it actually is a super cute compliment! This outfit looks stunning on you!